Unforgettable Return Gifts Let’s face it, when it comes to weddings, birthdays, house warming and other special occasions, nothing says “thank you” better than a memorable return gift. 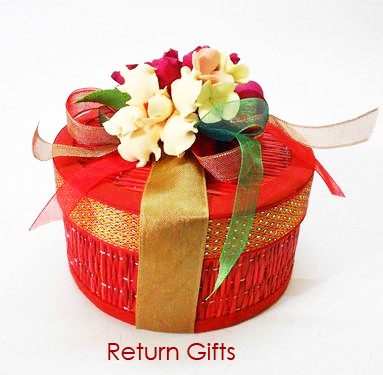 That’s right, return gift system has made a serious comeback in India – and possibly beyond. The good news is that there are myriad Indian handicrafts out there that can make for excellent return gifts. Ladies and gentlemen, if your big day is lurking around the corner, it’s high time to hunt for unique wedding return gifts. So, wear your shopping hat and scour the internet for the best handicraft items. Trust me your family and friends will keep them as souvenirs for many years to come. The story of return gifts is as unique and exciting as the items themselves. In essence, return gifts can be traced back to the ancient Europe. In those days, royal members, wealthy aristocrats, queens, and kings would typically gift their guests with a small box (a bonbonniere). More often than not, the box comprised a gem, precious stone, crystal, porcelain or even gold. Then came the sugar crisis era. In this epoch, it was considered noble if you gave out a return gift in the form of sugar. Something to reckon with, right? There’s more. As years went by, more and more cultures took up the return gift system, making it a norm in weddings, engagement parties, and so forth. In some cultures in Europe, for instance, newlyweds were considered to have a “good luck charm.” In principle, a return gift from a married couple was much akin to gifting “good luck.” Isn’t that impressive? So, what are you waiting for? 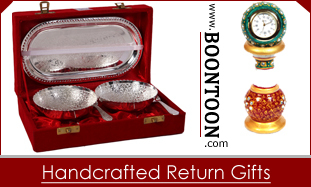 If you are looking to join the return gift bandwagon, look no further than Indian handicrafts. They simply make for an all-rounded return gift. Tips for Choosing a Good Return Gift? Want an unforgettable wedding return gifts? Done mate – go for something that has some cultural cue to it. For one, Indian handicrafts are known to appeal to father-in-laws’ innermost and basest feelings. No one likes a cheapskate. Pick something pricey, but not too expensive. The last thing you want after a wedding or any celebration is an empty bank account. Again, your return gift should be meaningful to both you and the giftee. Even better, go for something that symbolises your love. Don’t pick something that will end up in a dumpster or closet. Think about handicraft items that are sassy and stylish like a classy picture frame. Wouldn’t that add a little flair to someone’s home? Excellent handmade gifts for wedding return gifts.